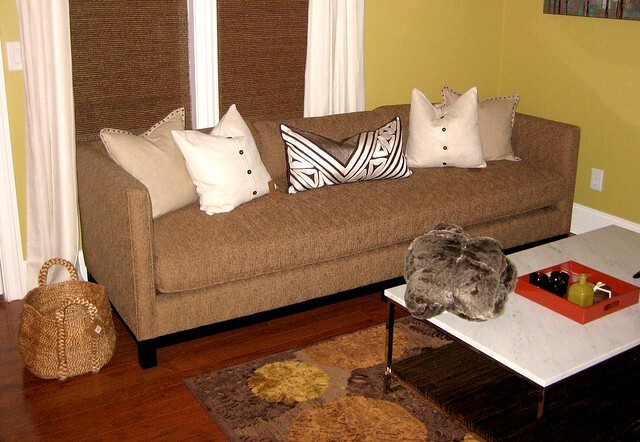 I love fabric & throw pillows... it's one of my favorite things about decorating, as you know. I often share with you fun pillows that I am loving, but today I'm sharing with you my go-to place(s) for SOLID pillows. Solid pillows are great for anchoring and works as a background for the more fun pillows. I often use Room & Board for solid pillows. They have a GREAT selection and good prices. The middle pillow is the statement maker (a splurge from Luxe), so I kept things simple on the sides. But I like how the nailhead and button details add a little bit of interest. You are right about the importance of solid pillows...I like Crate and Barrel as they have self piping and I just like that extra finish. That's interesting... I have seen Mohair completely rub off (like on a cowhide) on heavily used pieces. A client of mine had a mohair ottoman and where her and her husband put their feet, it was completely bare. I'm still a bit leery of using it on heavily used pieces. Sorry for jumping in here, but actually Mohair is very durable! The following is a mohair upholstery fabric description from an online fabric retailer, and I've read the same about mohair from several other sources. "This is an over the top gorgeous mohair from Donghia. This fabric is exactly what you see in magazines like Architectural Digest, Elle Decor, House Beautiful..... and durability wise, this fabric is sure to outlast you and me combined which is why many antique pieces you find have mohair velvet on them, they last a lifetime. In the early days of automobiles, Mohair velvet was the fabric of choice. Anyone restoring old cars chooses Mohair Velvet for its authenticity. it is also perfect to upholster an item you wish to hand down to your children. In other words, beyond durable incredibly gorgeous, soft as silk and lasts and lasts." Thank you for replying! I'll stay far away from the stuff until my kids are older. Goat hair. Who knew? Can I ask a silly question? What exactly is mohair? Is it like velvet? Why would it make one nervous to have? Great picks (and pics!). My new strategy is to hoard the $12.99 down pillows from HomeGoods and just trade out the cover when I find something else fantastic, usually on etsy. I can't find good inserts alone that cheap! thanks Bryn! great pieces. I'll take any of the mohair pillows! Pillows. Yum. Any chance of seeing a DIY pillow tutorial with some fabric sources soon? Maybe one solid side and one patterned one? The pillows are great from the HB article. But that sofa. Oh, love at first sight. I swoon! I love the R&B coral velvet paired with the neutral textured linen! These would be perfect for my hopefully soon to be navy couch. Great overview!